@ positive kat filming whatever she wants! Welcome to Saucy Side Productions! A few years back I had an idea for a documentary, which led to me working with friends and many other kind folks as I learned all about the various stages of hard work required to actually complete a documentary film...and I'm still learning. This site is a space for me to share projects I'm enjoying spending time on. I love writing, filming, editing and collaborating with others. I'm still a work in progress, but keen to keep learning and improving my skills as a storyteller and documenter of the many things I appreciate in life. For more on what I be, what I love to do, and how to get in touch, check out @positivekat. 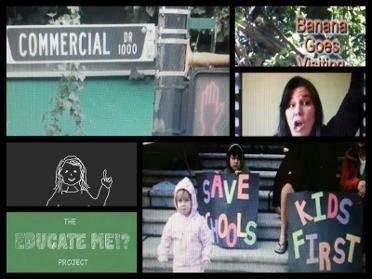 I value strong neighbourhood schools and am using my learning curve with filmmaking to try to inspire dialogue & action. The project has evolved as I've tried out many ideas looking for the right frame, and I'm passionate to keep trying to engage people with this project that celebrates thepotential for public education. Visit the Educate Me Project page to learn more about the past, present and future of this project. My daughter and I have fun creating things together. She has a natural gift for imagining stories, and combined with the skills I'm building while learning about filmmaking, we have found a new activity we love - turning her songs and stories into Sashaland Productions. She has a million ideas, and here is where you'll find our finished works as they're ready.